On July 28, 1912, an aerial contest between two well known aviators, Charles K. Hamilton, and Nels J. Nelson, took place in the town of Berlin, Connecticut. The well advertised event was attended by over 5,000 people. The first contest was the “testing of winds”. Hamilton was in the air for three minutes and four seconds, while Nelson remained aloft for seven minutes and ten seconds. The “quick starting” contest was held next. Hamilton got off the ground in 311 feet, 9 inches, while Nelson’s airplane only required 172 feet, 9 inches to get airborne. For the “bomb dropping” event, a target was placed on the ground and each aviator was to make a “bombing runs” at it using oranges. On his first run, Nelson’s orange hit the ground 51 feet, 1 inch, from the target’s center, and 9 feet, 10 inches on his second. His third orange hit 17 feet from the center. Meanwhile, Charles Hamilton’s oranges struck the ground 27 feet, 18 feet, and 47 feet, 8 inches, respectively. The final contest involved flying a figure-eight in the air. As Hamilton was starting to take off, an intoxicated man stepped in front of his aircraft and was struck in the head by one of the wings. He was knocked to the ground and received a bad cut. Once the man had received treatment, Hamilton took off, but only circled the airfield once due to wing damage from the accident. After making some repairs, he completed his figure-eight over the judges in just 55 seconds. Nelson completed his figure-eight in two minutes. When all the scores were tallied, it was determined that the contest had resulted in a tie. Little is known about Almenia Rice other than she was married to Daniel Rice, Jr., and both were circus performers; he a clown, she a tight rope walker, trapeze artist, and balloonist/aeronaut. What made her famous was her claim in 1902 to have made ascensions over the city of Boston in a kite capable of lifting a human being. The story first appeared in several newspapers around the country as early as December of 1901, and then in various magazine articles, beginning in 1902, and was still being referenced as late as 1977. What became of the Rice’s and their kite us unknown. The idea of kites capable of lifting a human being was being researched in earnest in the 1890s primarily by the military as an alternative to balloons as a way to observe enemy troop movements. The advent of the airplane and mechanized flight led to the discontinuation of this program. However, in 1901-02, before the Wright brothers had made their historic flight, there were still those hoping to perfect this form of aerial ascent. The kite used by Mrs. Rice was built by her husband sometime in 1901, and christened the “Dan Rice Junior” It was built with a wooden frame covered by canvas, 14 feet tall, 14 feet wide, and open in the middle, with a 5 foot long bar on which Mrs. Rice stood upon while making her flights. The first test-flight was reportedly made in October of 1901 from the roof of a hotel at 144 Tremont Street, across from the Boston Common. Subsequent ascensions were also made there. Boston, Feb. 11 – Supported 500 feet in the air by a kite, a daring little Boston woman has taken a birds-eye view of the Hub. Mrs. Rice enjoys the distinction of being the first woman in the world to navigate the air with a kite as a craft. 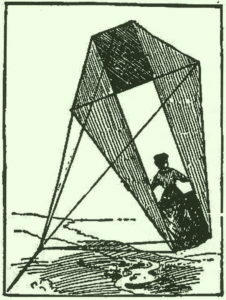 The man who built the kite – her husband – knew full well the sustaining power of this instrument, he says he felt no thrill when he launched her forth from the roof of the building at 144 Tremont Street. The woman lay prone in a frail wooden frame, buoyed up by a few square yards of canvas, floating horizontally and guided only by a slender cord, with her husband at the windlass far below. During the proceedings Mrs. Rice’s life actually hung on the cord by which the kite was flown. Had the kite “string” broken she would have been hurled to her death on the pavement of house tops. As to being hurled to her death, one account related how Mrs. Rice took the precaution of wearing a parachute. The following newspaper article appeared in the Willmar Tribune, (Wilmar, Minn.), on July 9, 1902. To mount into the air upon on of the bars forming the frame of a huge kite is a feat which would seem too perilous to be undertaken, and yet it has recently been done by a woman, Mrs. Almenia Rice, of Boston, has the unique distinction of being the first to use a kite as an aerial vehicle, says the Metropolitan Magazine. What is more, this daring woman enjoyed the experience so keenly that she declares her intention of making this her chief pastime in the future. The kite upon which she made her venturesome flight was built for her by her husband, Mr. Dan Rice, Jr.
“I’ve never had such a delightful sensation” declared she, “as I experienced when my kite was given its freedom and I rose gently into the air. The ascent was made gradually and evenly as a bird wings in flight. There was no jerking, no terrible breath-taking rush, but just a delightful glide into space, away from the noise of the city into the mystery of the ether. Mrs. Rice says that when Santos-Dumont crosses the ocean in his airship she will meet him above the clouds in her strange vehicle. She has already been up 200 feet above the business districts of Boston, and in the depth of winter, without experiencing any discomfort, so that she feels confident that she can go upward to a height of 3,000 feet in summer time without any danger. Mrs. Rice’s monster kite has wooden strips running from the top to the bottom, 14 feet in length; the little bar at the bottom on which she stands measures five feet in length. The two big white wings for the sides of the kite are 14 feet long. The line is three-eighths-inch bell rope, made of Italian flax, and will withstand a strain of 1,000 pounds. dressed as a boy, so as to attract as little attention as possible, Mrs. Rice made her first ascent from the top of a building in Boston. She has made balloon ascensions, walked a tight wire far above the ground, and swung trapezes, “but the kite sensation was not at all like these,” she says. Pearson’s Magazine, Vol. 15, January to June, 1903, Page 114. Library of Congress, “Letter From Alexander Graham Bell To Samuel P. Langley”, February 15, 1902.